Cattle take shelter from the heat at the Jim Thoma farm south of Jesup. Nursery pigs at Iowa Select Farms in Iowa Falls. Pork production was approaching a record this year. WATERLOO | Iowa beef, pork and dairy producers say 2015 was a good year, depending on which side of the business one examines. But it was poultry that dominated the year’s headlines in the wake of an attack of highly pathogenic avian flu, which wiped out more than 31.5 million chickens and turkeys. Iowa’s egg-laying flock was cut nearly in half, according to the Urbandale-based Iowa Poultry Association. “It’s been quite a year, I know,” said Randy Olson, the association’s executive director. The outbreak, which struck in April and delivered a particularly strong blow to operations in western and southern Iowa, was a first for the state, Olson said. It wasn’t an easy year, from that standpoint, Iowa Agriculture Secretary Bill Northey said. Egg and poultry producers are still in recovery mode, Northey said. “Some are probably a year away yet,” he said. But all are on the way back and likely will be wiser for the experience, Northey said. Other livestock industries across the state have learned from the avian flu experience, although it didn’t affect them directly, Northey said. State agriculture officials put together a number of action reports about industry responses to the emergency and how it might react in the future, Northey said. “There’s been a lot of learning from this experience,” he said. Iowa briefly lost its spot as the top egg-producing state in the country, as the avian flu outbreak took hold, Northey said. Recovery will take some time, he said. There had been some fears that the fall migration could bring a resurgence of the avian flu, but that had not materialized by late November, Northey said. Olson noted farmers responded swiftly and prevented a bad situation from becoming much worse. For the first time since 2000, another state – Ohio -- produced more eggs than Iowa in a given month. According to USDA’s September report Iowa’s egg production was 732 million eggs, compared to Ohio’s 739 million. Beef producers rode a wave of high returns in 2015, but prices are coming down. Jesup-area producer Wesley Thoma says he’s holding on for what shapes up to be a bumpy ride. The third-year Jesup-area cattle farmer says he is finishing up a good year. Returns in the next year may not be so good, however. “The cow-calf side has been pretty good since I started, but the feedlot has a tight margin,” he said. “It’s hard to make money if you’re just buying calves. Iowa beef producers are starting to rebuild herds, the numbers of which nationally had been falling in recent years, due to weather conditions in the South and West. U.S. meat production is forecast to be rise 2.9 percent in 2016, with beef up 4.8 percent and pork up 1.7 percent, according to a recent report from USDA. Turkey production is estimated to be up 7.9 percent next year, with broiler production up 1.9 percent. Northey said it was a “pretty good” year for beef and pork producers in the state. “Especially early on, we had good prices on both and with the decreasing grain prices, and it meant cost of production was lower,” Northey said. Prices started to come down as the year waned, Northey said. Conditions were largely acceptable through the summer, especially compared to the poultry and egg producers’ experience, he said. “There were no real additional health issues,” Northey said. Returns have declined “significantly” on the feeder cattle side, Northey noted. Thoma, whose herd numbers about 135 animals, gave his year passing marks. Pork producers had their own disease-related issues to deal with a year ago, with an outbreak of porcine epidemic virus cutting into production. But, the industry bounced back in a big way in 2015, said Jen Sorenson, communications director at Iowa Select Farms Inc. in Iowa Falls. 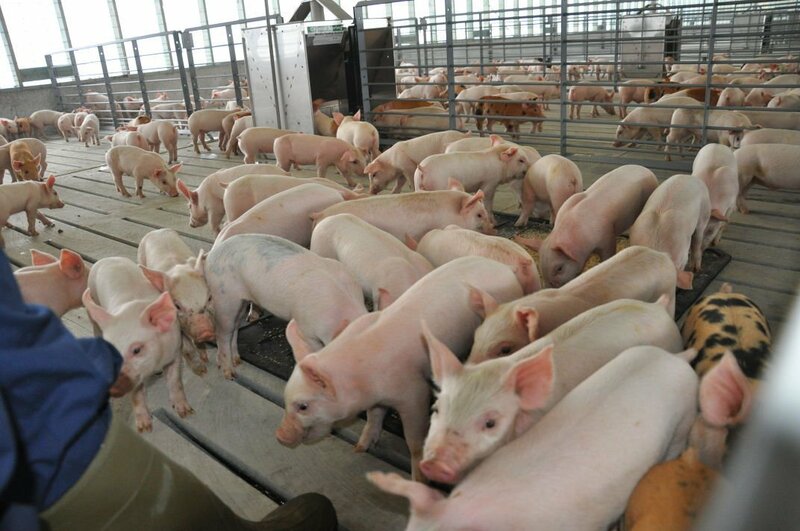 The U.S. pork industry relies heavily on exports, which traditionally play a big role in determining hog price direction and this year was no different, Sorenson said. “Unfortunately, labor disputes at West Coast ports early in the year and the ongoing strength of the U.S. dollar has created challenges for U.S. pork in the global marketplace,” she said. Iowa's dairy industry followed trend in 2015, with prices not always covering costs, said Larry Tranel, dairy specialist with Iowa State University Extension. "The only place where we see some decent profits is organic dairy and organic crops," he said. "So, the organic side actually fared pretty well, but the conventional side had some pretty low prices we're dealing with as we speak." Going forward, milk producers likely aren't anticipating any notable price increases in the coming year, Tranel said. "It may be a tough go again next year," he said. "With that said, it only takes one small thing happening in the export market or overseas to change that supplies." Overall, though, Iowa dairy farmers appear to be in "pretty good shape," Tranel said. "Farmers tend to be pretty optimistic, hoping next year is going to be better, and chances are it will be," he said. "How much, we don’t know."